An effective concentrate mixture to help remove salt deposits from all marine surfaces leaving a clean, protective coating to help guard against future salt damage. 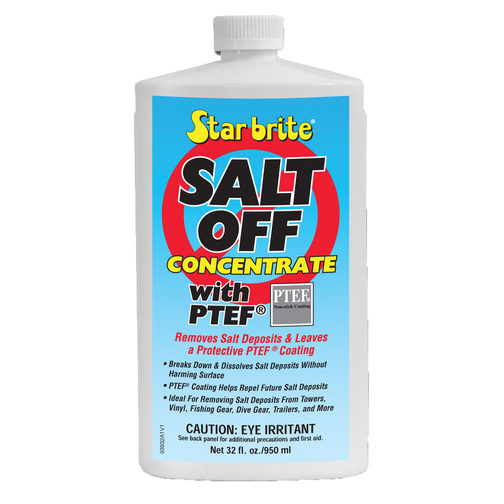 Star brite Salt Off is an effective way to remove salt deposits from all marine surfaces leaving a clean, protective coating to help guard against future salt damage. 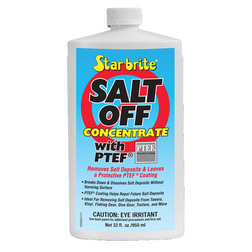 Salt Off is designed to remove salt deposits gently and leaves a protective PTEF coating which helps prevent future salt build up. Salt Off can be used on most marine surfaces including fibreglass, aluminium, stainless steel, rubber, plastic, magnesium and paint. It can also be used as a motor flush fluid to help clean out outboard waterways, it can also be used on fishing equipment, trailers, diving equipment and deck rails.